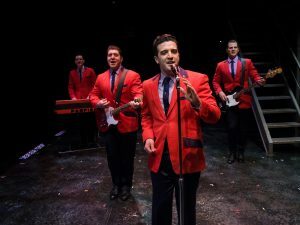 Jersey Boys, the jukebox musical that opened last week at the Center Theatre Group/Ahmanson Theatre is like a visit with your colorful, occasionally chaotic relatives. It’s great to see them once in a while, catch up on old stories and reminisce–but it’s also hard to ignore the fact that they are getting a bit older – perhaps slowing down a little. Despite that, you realize you love them just the same. The fun you have with them always leaves you with warm and fuzzy memories. That certainly holds true with the current production starring Mark Ballas, (reprising his Broadway performance) as Frankie Valli. Joining him are Matthew Dailey (Tommy DeVito), Keith Hines (Nick Massi) and Cory Jeacoma (Bob Gaudio) as his bandmates. Four young guys who discovered a musical sound nobody had ever quite heard before. For those who don’t know the story, the Four Season’s harmonies were perfect on stage while off stage it was quite a different situation. Their connection to a criminal element, their failed relationships inside and outside the quartet, and particularly Tommy DeVito’s irresponsible handling of the group’s finances eventually lead to a breakup, handing Frankie Valli a hard fought for but ultimately a successful solo career. 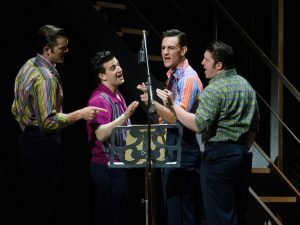 With a book by Marshall Brickman and Rick Elice and directed by Des McAnuff, Jersey Boys is fast-paced episodic storytelling. It covers a significant segment of the quartet’s lives, from their early years to their induction into the Rock and Roll Hall of Fame. It takes close to forty minutes before their first big hit song, “Sherry,” is performed but from that point on, the hits here just keep on coming, and that’s what really make the show so much fun. Songs such as “Big Girls Don’t Cry,” “Oh What A Night,” “Walk Like A Man,” “Can’t Take My Eyes Off You” and “Working My Way Back To You” have the audience clapping and singing along. You are almost guaranteed to leave with a smile on your face. While Ballas works hard to bring Frankie to life it is clear that the demands on him as a vocalist are daunting. It is no wonder that Aaron De Jesus and Miguel Jarquin-Moreland also portray Frankie at certain performances during the week. On opening night you could hear Ballas strain a little by the second act but it was a strain many probably wouldn’t notice or care about. Truth be told he is charming Frankie Valli. The ensemble of “Jersey Boys” includes Mark Edwards, Corey Greenan, Bryan Hindle, David LaMarr, Austin Owen, Kristen Paulicelli, Leslie Rochette, Andrew Russell, Jenna Nicole Schoen, Dru Serkes, Jonny Wexler and Jesse WildmanJesse Wildman. The production maintains the slickness that was a signature of the Broadway production. The use of on-stage video intercut with shots of Ed Sullivan and audiences from the 60s enjoying the Four Seasons are a great touch and the introduction of the real life Frankie Valli at the curtain call was a very special moment on opening night. His presence brought the house down. 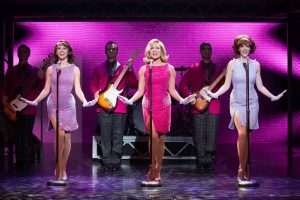 Whatever minor shortcomings the show may have, it is undeniable that Jersey Boys is a phenomenal worldwide hit and this touring production guarantees a good time. When: Through June 24, 2017. Tuesday through Friday at 8 p.m.
Saturday at 2 and 8 p.m. Exceptions: Added performances on Thursday, June 22 at 2 p.m.
information and charge: visit CenterTheatreGroup.org/ACCESS.